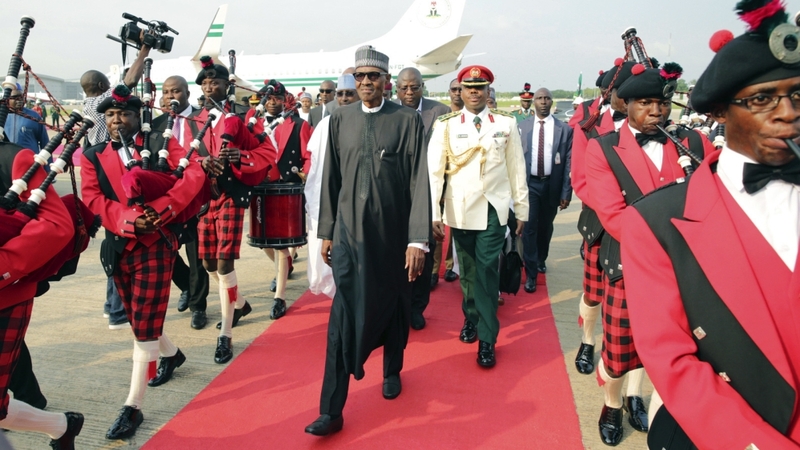 Muhammadu Buhari, President of Nigeria, brought his 103-day medical leave in the UK to a grand end on Saturday. Despite protests at home and abroad against his lengthy absence from work, his return to Nigeria was surprisingly heroic. Once Femi Adesina, his much-maligned spokesman, confirmed the president’s anticipated return, a “joie-de-vivre” atmosphere enveloped the capital, Abuja. The most important figures in governance all converged on the Nnamdi Azikiwe International Airport while a not-so-privileged crowd, numbering in tens of thousands, lined up outside. At exactly 4:46pm, Buhari disembarked from the plane, held Vice President Yemi Osinbajo with his left hand and with his right acknowledged cheers from the crowd and his cabinet. Buhari’s drive home was not easy, his security details worked hard to clear off the delirious crowd outside the airport to allow the president’s car to move forward. It was a truly remarkable sight to behold, reminiscent of the wild celebrations that greeted Buhari’s landmark victory at the 2015 polls. “Buhari is a man whose presence looms large”, an excited Adesina remarked afterwards in an apparent jibe at those who mocked the president’s ill-health. A few days later, there are huge question marks over the accuracy of Adesina’s assessment. Two days after his return, Buhari transmitted a letter to the legislature confirming his official resumption of duties. But he signed that letter at home – not at his office. Ordinarily, that wouldn’t be worrisome, but there’s been some bad precedent. On April 26, when Buhari absented himself from the weekly Federal Executive Council (FEC) meeting for the second time in a row, Lai Mohammed, Minister of Communication, leapt to his defence, saying: “He will be working from home. He has asked all his files to be taken to him in the house”. Eleven days after, Buhari announced that he was embarking on medical leave, reluctantly admitting he needed more treatment time in the UK. In all, he had missed four consecutive FEC meetings, including one that was cancelled altogether on frivolous grounds. This is why Buhari’s latest relocation of his office to his residence is not ordinary. After working from home on Monday, he met service chiefs on Tuesday – again at his residence. And on Wednesday, it has been announced that this week’s FEC meeting was cancelled as President Muhammadu Buhari continues to work from home. The excuse given by Garba Shehu, Buhari’s second media aide, is that “following the three months period of disuse, rodents have caused a lot of damage to the furniture and the airconditioning units in the President’s office,” consequently rendering it unfit for use. It’s the shakiest defence possible: Buhari’s aides had prior knowledge of his return, and had all the time in the world to fix his office. Unfortunately, enormous work awaits Buhari. Nigeria’s yearlong recession could extend beyond expert postulations unless urgent measures are taken to curb high inflation and stagnation. Since the freeing of 82 Chibok girls in exchange for five Boko Haram commanders in May, insurgency has blossomed in the northeast. Earlier this month, Boko Haram killed 27 and wounded 83 in triple suicide bomb blasts in Konduga, near Maiduguri. Buhari’s anti-corruption war is in tatters, with anti-graft and security agents hustling to outshine one another – consequently negating rather than complimenting each other’s work. Buhari’s effort to cleanse his own cabinet of corruption has lost gumption due to the lack of a definitive leader. For example, no one knows the fate of Babchir Lawal, his secretary, whom he suspended and ordered to be probed by an Osinbajo-chaired panel. The panel’s report is ready and it will be presented to Buhari on Wednesday, but who will enforce it? All these, and much more, mean it is neither in Nigeria’s nor the president’s interest for him to combine recuperation with work. It is increasingly looking likely that Buhari returned to Nigeria out of determination – maybe desperation – to recover the power he temporarily surrendered to his deputy, and to shut down calls for his return or resignation. Constitutionally, Buhari has done no wrong by clinging on to power even if he can only work from home. Unless two-thirds majority of his cabinet passes a resolution declaring him incapable of discharging the functions of his office, unless this declaration is verified by a five-man medical panel appointed by the Senate president, unless the medical panel certifies the president unfit, and unless the two heads of Nigeria’s bicameral legislature gazette the panel’s finding, all in that order, Buhari can commit no constitutional breach by recuperating in at home for as many months as his doctors prescribe. There’s not even a chance for this scenario to occur, given the most vital members of his cabinet have previously taken turns to lie about his recovery. That a president could be away from work for that long, in the first place, is one of the many blemishes of the 1999 Constitution (as amended). Buhari came to power in 2015 on the back of a reputation for integrity and incorruptibility. While the latter has never been in doubt, this is the time he must prove the former. He was on medical leave for 153 of the first 231 days of the year – that’s 66 percent of the year! – and his return has so far been unconvincing. Buhari’s stay in office or resignation is simply an integrity question – and integrity is personal, not constitutional. Unfortunately, no one other than the president, based on medical advice, knows if his body is able to withstand the rigour of his office. Buhari reserves the right to treat himself and recover fully but the country shouldn’t be held to ransom. Nigeria deserves a substantive president – not just in name but also in practice.